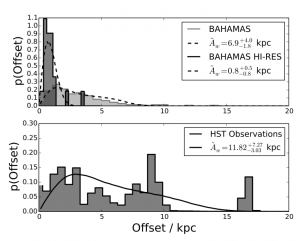 Wobbling Galaxies: Evidence of Dark Matter Interactions? The identity of the phantom dark matter particle that dominates the Universe around us remains elusive. Scientists have searched for signs of dark matter in deep mines, designed to keep out all but the weakly interacting dark matter particle (e.g. the LUX experiment). They have searched at the Large Hadron Collider for signs of dark matter particles created in energetic collisions (check out this Particlebite). However, these methods of detecting or creating dark matter have yet to reveal the hidden identity of these ghostly particles, leaving us with the original dark matter laboratory – the astrophysical universe – as the best place to search for clues to the particle nature of dark matter. Clouds (or “halos”) of dark matter surround the bright astrophysical objects that we can actually observe, and interact through gravity to influence these systems. (Gravity is the only force that we know affects dark matter.) Therefore, although dark matter has passed straight through our detectors and remained invisible, we can look at stars and galaxies and infer how they have been gravitationally affected by the dark particles. So far, astrophysical observations have taught us that dark matter is not relativistic (it’s “cold”), it’s not electrically charged (or it would interact with photons through the electromagnetic force and we would be able to see it! ), and it can’t have more than very rare interactions with normal matter through any force but gravity. However, there are many things we still don’t know about dark matter particles (in addition to the big one – what are they? ), including the question addressed in today’s paper – how do dark matter particles interact with each other? Do they pass through each other like they have passed through our detectors? Or can they bump into and scatter off of each other? 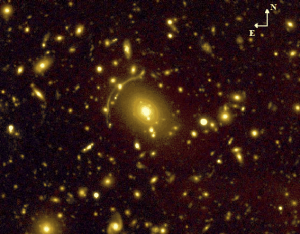 David Harvey and his coauthors use simulations and observations of galaxy clusters to study possible self-interactions between dark matter particles. In particular, they consider how the central galaxy of a galaxy cluster (referred to as the Brightest Cluster Galaxy or BCG, Fig. 1), would behave if the surrounding dark matter particles did not quietly pass by each other, but instead bounced off of each other transferring energy and momentum, like colliding billiard balls. Dark matter collisions in the halos around galaxy clusters boost the angular momentum of the particles that have settled near the center of the halo in a high density peak, enlarging their orbits and spreading them out to form a lower density central “core.” (Fig. 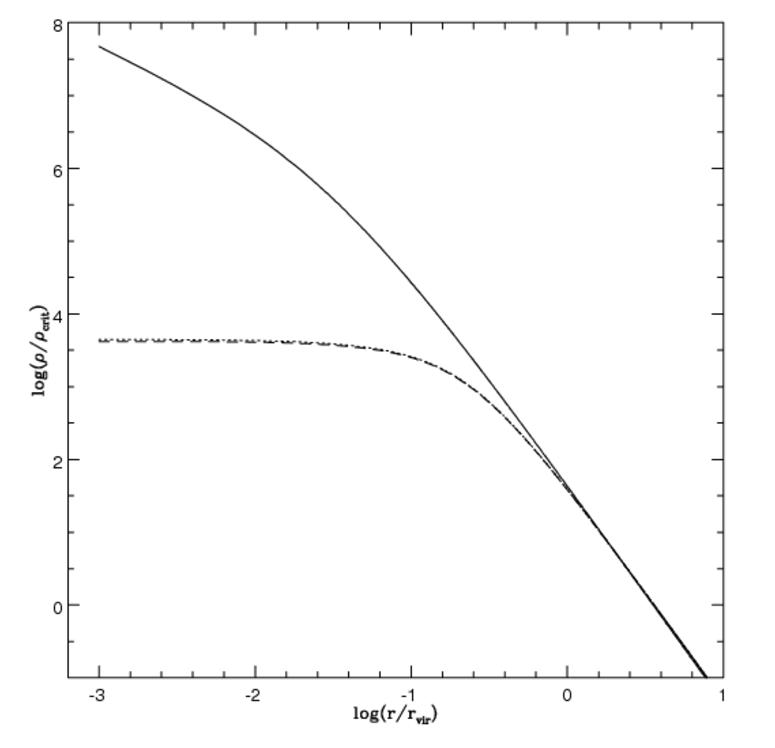 2) Gravity causes the BCG to settle into the region of the dark matter halo with the highest density. In peaked halos this is a small area at the center of the dark matter halo, but in cored halos the maximum central density plateaus and is spread over a larger region, allowing the BCG to move around without being trapped in a density peak at the center of the halo. In particular, after collisions between clusters the disrupted BCG will be left “wobbling” back and forth if a core has in fact been created by dark matter self-interactions, whereas a BCG located in a density peak will settle down much more quickly. This is an awesome result that could lead to new insight into the nature of dark matter. However, it is important to keep in mind that simulations and observations both contain significant sources of uncertainty. Just as the quality of observations is limited by the technological constraints of telescopes and cameras, the quality of simulations is limited by the technological constraints of the computers on which they are performed. In particular, the complex, densely-packed inner regions of galaxy clusters that are relevant to this study require huge amounts of computational power and simulations inevitably include approximations and uncertainty. That being said, future work using more accurate simulations and a larger number of higher quality observations will provide exciting insight into whether there is in fact strong evidence for cores in galaxy clusters and whether these cores are formed by normal galaxy physics or by exotic dark matter self-interactions.